You might (like me) think twice about eating from the average burger van, not fancying the fat laden offering. There are exceptions of course, at the farmers’ market, with trailblazers such as Stoats Porridge but these are few and far between. My preconceptions had to change in Portland. Here the food cart (van) is king and are the favourite places for city folk to grab lunch. No-one seems to be able to quite agree just how many there are, but it could be anything between two and four hundred across the city – there is even a website dedicated to reviews and information on carts. Located on parking lots with tolerant owners (we frequented SW Alder, between 10th and 11th), the carts specialise in one type of cuisine, and sometimes even just one dish Pho for instance (a spicy soup). You can dine very nicely for $6 to $8 a plate (approximately £4 to £6). 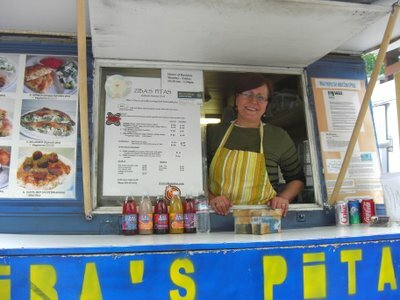 Talking to a cart owner, you will encounter a very passionate person, for instance Ziba – her cart is dedicated to food from Bosnia. I discovered that she gets up at 5.30 am each morning to make the special pastry used in her pitas. It is similar to filo pastry is made all by hand with flour and water, she stretches and stretches the dough until it is almost see through. Stuffed with rich meat mixture, it makes a hearty and very filling dish. At another cart, Aybla’s Grill we encounter Saied’s falafel which are light and spicy, at a third the most delicious soup a tasty broth with an Asian twist. At Savor, the most delicious clear soup with chicken and lemon grass kept us very happy. Sometimes, such as at Tom’s Thai food (at the Saturday Market) when you cannot decide what dish to try, he will load your plate for a little for everything for $8. 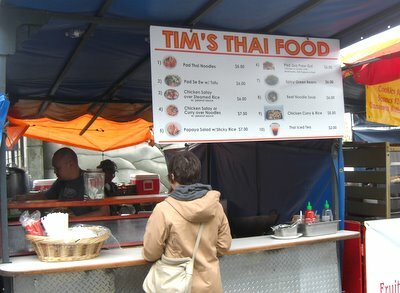 The choice is astonishing, Egyptian, Vietnamese, Indian, Burritos, fish and chips, you name it, you will probably find it. The often lengthy queues do not deter office workers who wait patiently for their turn – nothing will deter a Portlander from his lunch! 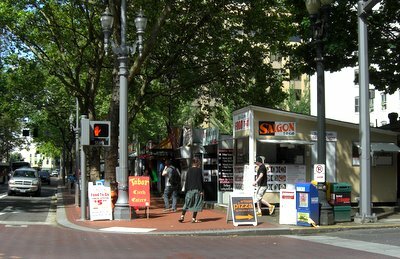 If you do get a chance to try the cart in Portland (and they are in other cities such as New York and San Francisco too), make sure you seek them out Monday to Friday and in the main at lunchtime only, they’re mostly shut on weekends and evenings. Some also shut during the winter time – it’s just too cold to get the gas going sometimes. So, do you think it could work in Scotland? An intriguing concept – or would our obsession with health and safety and the lust for parking charges kill any hope of an influx here?